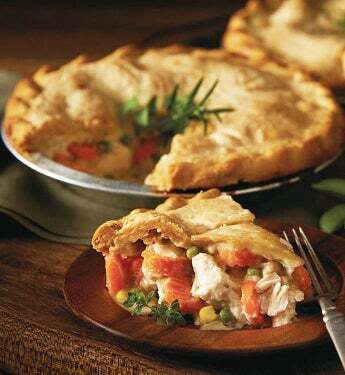 Choose One or Two chicken pot pies filled with tender white meat chicken, sautéed onions, carrots, peas, celery, chunks of potato and the perfect blend of herbs and spices. This is one of our favorite meals. A true comfort food. When we make it, we make the traditional way, with flaky, buttery, hand-crimped crust and hearty, homestyle filling. There's nothing better than two homemade chicken pot pies, especially with the finest gourmet ingredients. Pot pies filled with tender white meat chicken, sautéed onions, carrots, peas, celery, chunks of potato and the perfect blend of herbs and spices.